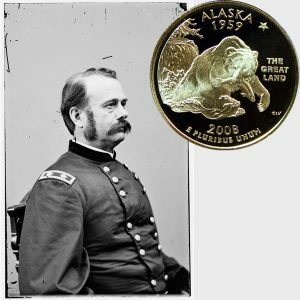 Today, the Alaska State Quarter Coin remembers when General Rousseau as representative of the United States formally accepted the transfer of Alaska from Russia on October 18, 1867. New Archangel, Sitka, October 26 (14-26,) 1867. We, the undersigned, United States and Russian commissioners, Captain Alexis Pestchouroff, of the imperial Russian navy, appointed by his Imperial Majesty the Emperor of Russia, to transfer and deliver, and Brigadier General Lovell H. Rousseau, of the United States army, appointed by Andrew Johnson, President of thr United States, to receive, the territory coded by his Imperial Majesty to the United States of America by treaty bearing date the thirtieth day (18-30) of March, A. D. eighteen hundred and sixty-seven, met at the town of New Archangel, in the territory above named, to fulfill our commission; and on the eighteenth (6-18) day of October, in the year eighteen hundred and sixty seven, at the governor’s house in that town, Captain Pestchouroff, as such commissioner, for and in the name of his Imperial Majesty the Emperor of Russia, formally transferred and delivered to Lovell H. Rousseau, as commissioner as aforesaid, who received the same for and on behalf of the United States, the territory, dominion, property, dependencies, and appurtenances, ceded to the United States of America by the treaty above referred to and as bounded and described in that treaty. The transfer was made under mutual salutes of artillery, the United States taking the lead, and in strict accordance with our instructions in that behalf. In pursuance of our respective instructions, Captain Pestchouroff, as such commissioner, also delivered to General Rousseau, as commissioner aforesaid, the government archives, papers, and documents relating to the territory and dominion above named, also the forts and public buildings, including the governor’s house, dock-yards, block-houses, barracks, batteries, hospital, wharves, and schools, in the town of New Archangel, an inventory of which, marked A, is attached hereto as part hereof. We left, as instructed, in the hands of the Greco-Russian church the church buildings, appurtenances, and parsonages to the same belonging, as shown and described in inventory marked B, attached hereto as part hereof. We gave certificates of ownership to the individual owners of private houses and of lots in fee simple in the town of New Archangel, as directed, a list of whose names is presented in inventory marked C, attached to and made part hereof. In inventory marked D, attached to and made part hereof, are shown the houses and buildings owned by private individuals in New Archangel, the owners thereof having no title in fee to the land on which they are situated. A map of the town of New Archangel is also attached as part hereof. The letters and numbers on the margins of the several inventories aforesaid correspond with those of the said plan of the town. As we were unable to visit Kodiak personally, we took no action touching affairs there. The public property there is certified to by the governor of this Territory, in inventory E, attached and made part hereof, and the military authorities can take possession of the same at any time. The Alaska State Quarter Coin shows with an image of General Lovell H. Rousseau, circa 1860.